Ladder stand off assembly; 12 Inch trim down, sold individually. 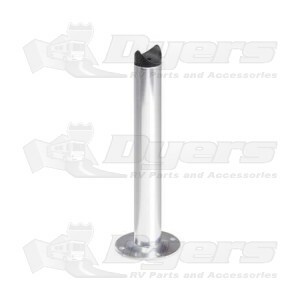 With a round base, this stand off will neatly replace your RV ladder's original stand off. The length allows you to trim to your specific ladder needs. The stand off includes the base plate, stand off tube, connector nut, fitted black plastic ladder receiver and screws for mounting to the coach wall. When applicable, use the longest length screw possible for the most secure hold.